There will be significant winners and losers to the current U.S.-E.U. trade war, but none more so than in the automotive sector. Size matters when it comes to reshuffling production among plants to avoid import tariffs. According to the Financial Times, larger companies like Toyota, Volkswagen, and the Renault–Nissan–Mitsubishi Alliance (RNM), all of which make roughly 10 million vehicles a year, have the capacity to move production between plants. Toyota is probably the best placed, with two-thirds of its cars sold in each region already made within the borders of that region. The VW group, with 122 factories around the world, has considerable flexibility and, like Toyota, has been a pioneer in flexible manufacturing systems that allow it to make a range of vehicles at each site. Mid-sized players, such as BMW and Daimler — who according to the Financial Times make only about 2 million cars a year — do not have the same scale to shift production closer to the customer. For them, a new plant is a major strategic investment, while small volume producers like Volvo and Jaguar Land Rover, producing less than 1 million cars a year, could be severely hit. The Financial Times points out the U.S. is JLR’s largest market, but that almost all of the company’s production is based in Europe. The automotive sector is both an easy and economically sensitive target. For many countries, auto export sales are a significant contributor to the balance of payments. International sales account for 80% of Britain’s production, 82% of Mexico’s and 78% of Germany’s. 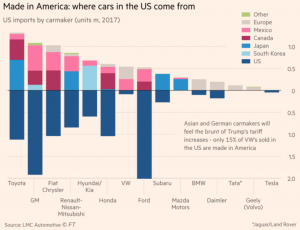 The Financial Times reports that half the cars sold inside the U.S. are made outside the country, with Mexico, Japan and Europe being the largest importers. Yet, U.S. exports are also a significant factor, with almost one in five of the cars made in American plants going overseas. Automotive manufacturers are not going to rush to build new production facilities in the U.S. in the short term, but if tariffs become a permanent feature then it’s likely to encourage the car industry to accelerate the shift towards regional production. 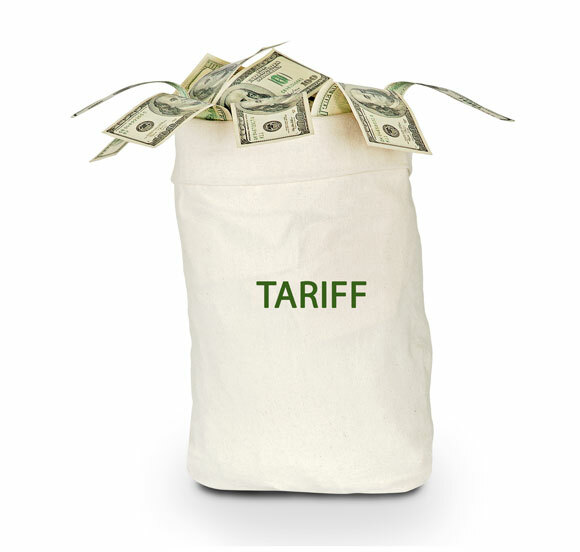 Those with scale will cope better and as such we could see further consolidation in the sector if tariffs become a permanent feature — not just in the U.S., but internationally, as trading partners retaliate against U.S. action.